Network with Greek and Greek American business professionals, promote yourself, explore business opportunities and form strategic partnerships with successful entrepreneurs and business owners. Get a pocket full of business cards, join our events, and get a stack of new connections. Greek business owners and entrepreneurs are successful because they're experts of their own businesses. Whether you're in hospitality, education, sales, technology, finance, retail, marketing or any industry, it's a great way to connect with other Greeks. We are creating a business/professional membership community of success-minded Greek Americans who are serious about networking, helping others and transacting business. 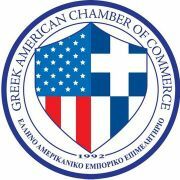 We plan to create chapters throughout the U.S., and our website GreekAmericanChamber.com will provide unparalleled marketing and promotion opportunities for our members. Our philosophy is that you must first and foremost give to others "first." We believe that by giving and being "other-focused" you create a world of abundance for all. For us, networking is really the art of "giving" and searching for ways to serve the needs of others before focusing on ourselves.